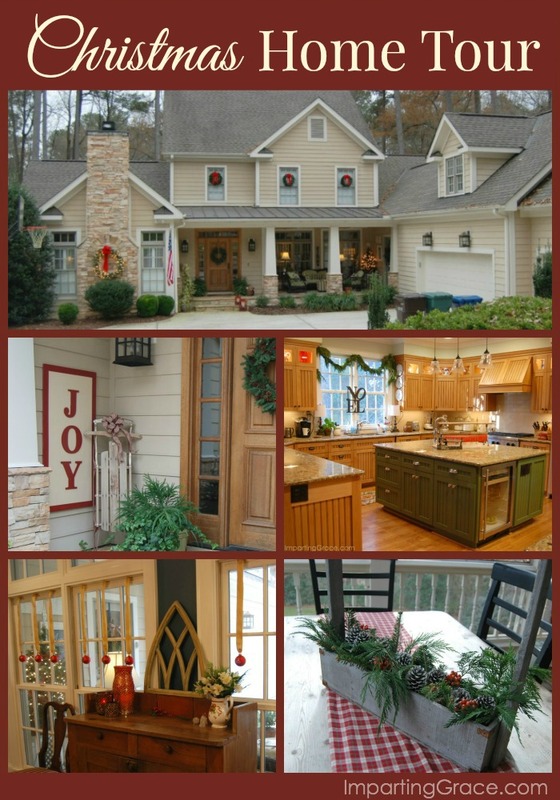 It's time for Christmas home tours, and I'm so glad to welcome you! This is how we wish it looked. 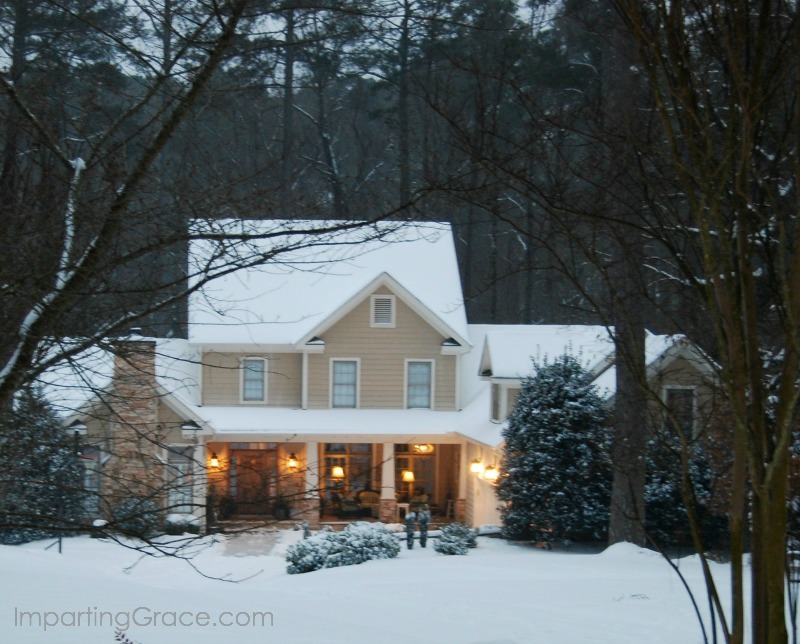 . . but since we're in North Carolina, a white Christmas is usually just the stuff of dreams. Still, things are pretty Christmasy around here. Take a look! 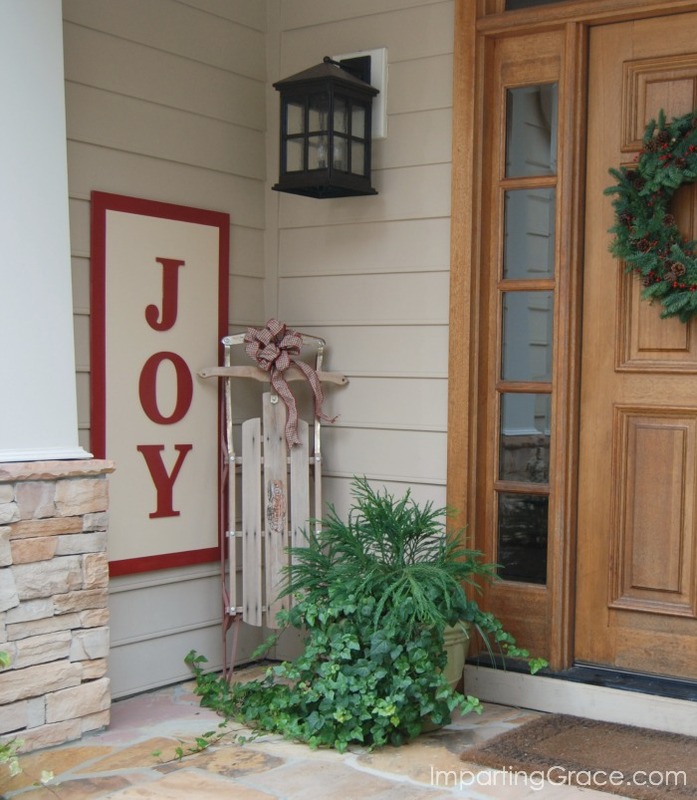 At the front door you'll be greeted by my DIY Joy sign and my kids' old sled. I hope being here fills your heart with Christmas joy! On the front door is my wreath. I've always admired wreaths made of noble fir, but find them too pricey. This year I bought 4 feet of noble fir garland and wired it onto an artificial wreath. I added berries, pine cones, and a bit of ribbon. Presto! A noble fir wreath for a fraction of the cost! 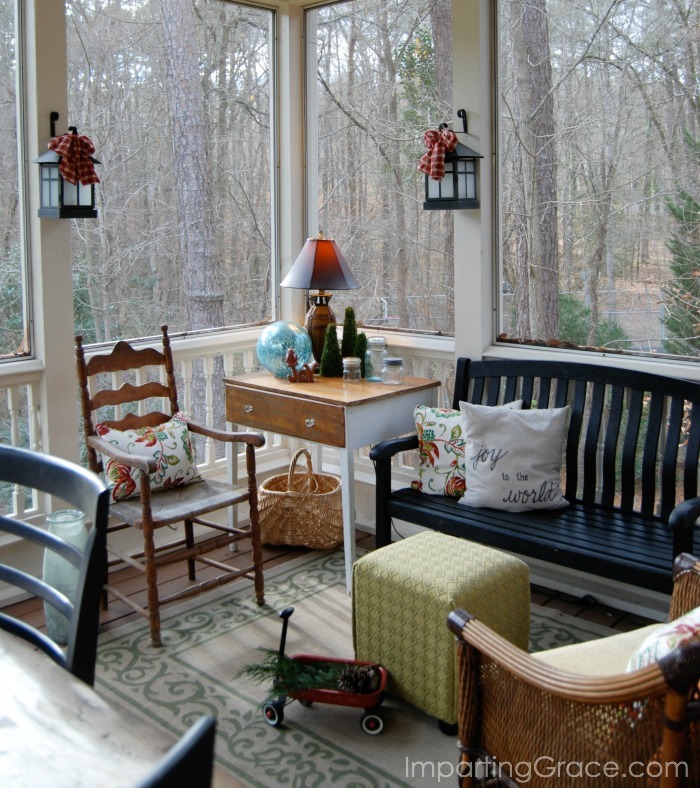 When it's not too chilly, we can pause here on the front porch for a bit. But it's been pretty cold lately, even if it's not snowy--so come on in! 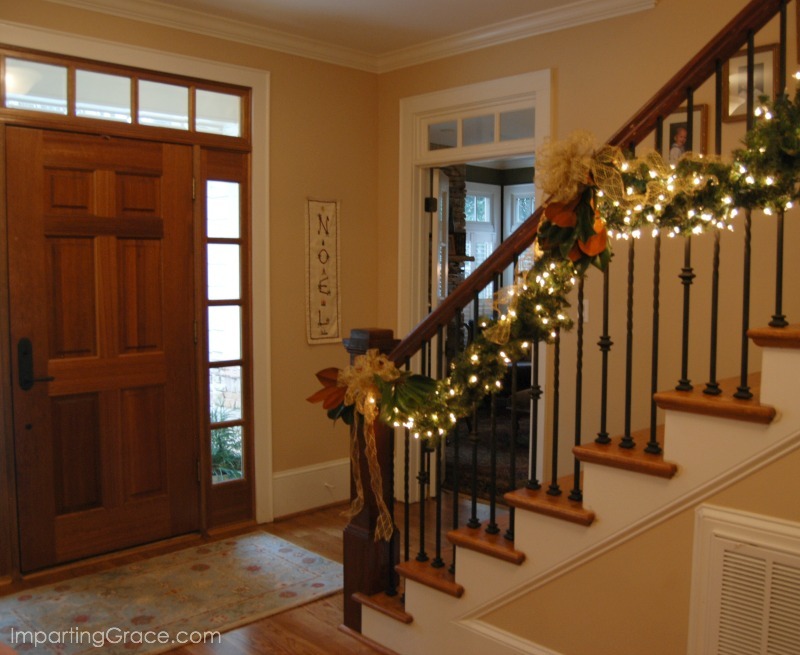 Here in the foyer you'll find simple decorations--a lighted garland and our Christmas village. My kids started this Department 56 village for me back in 1995. I love it displayed here under the DIY watercolor of our house. I mass poinsettias under the table to hide all the unsightly cords! This year I added a new banner to the foyer. It was made by widows in Bangladesh through the good work of a ministry called The Widow's Friend. 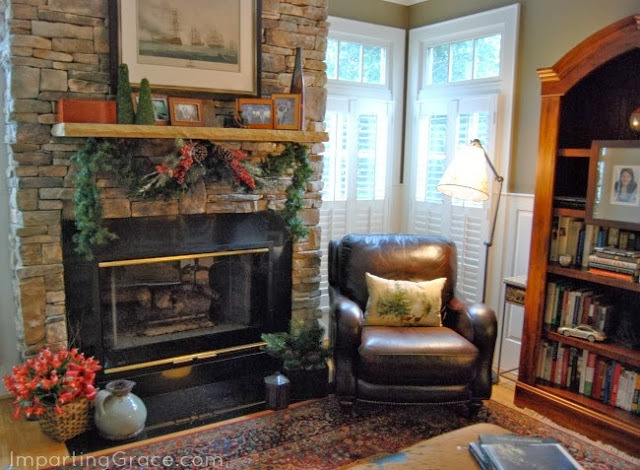 To the left of the front door is my husband's study, where the decor is simple to go with the rustic stone fireplace. 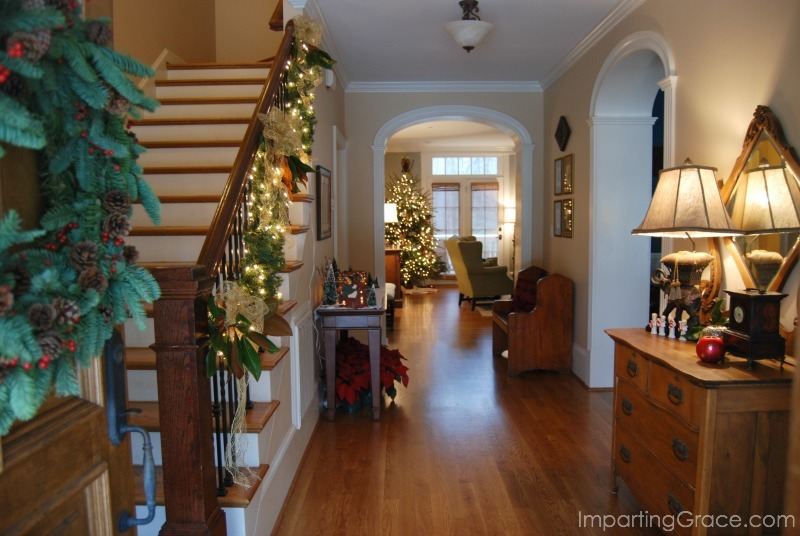 To the right of the foyer is the dining room, which was fun to decorate this year. 2014 marks the 15th anniversary of my mom's death, so this room is full of things she loved. 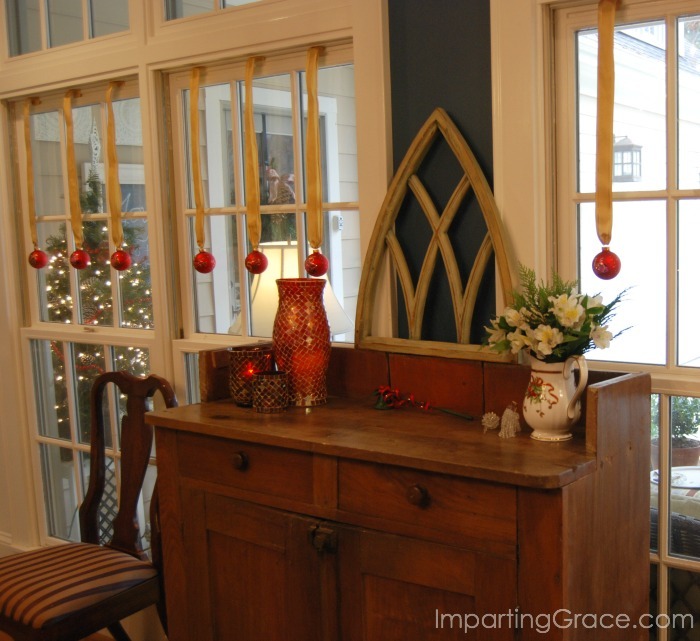 My favorite things this year are the 12 Days of Christmas ornaments hanging in the dining room windows. along with a basketful of cherished Christmas books. I love looking through these every year! 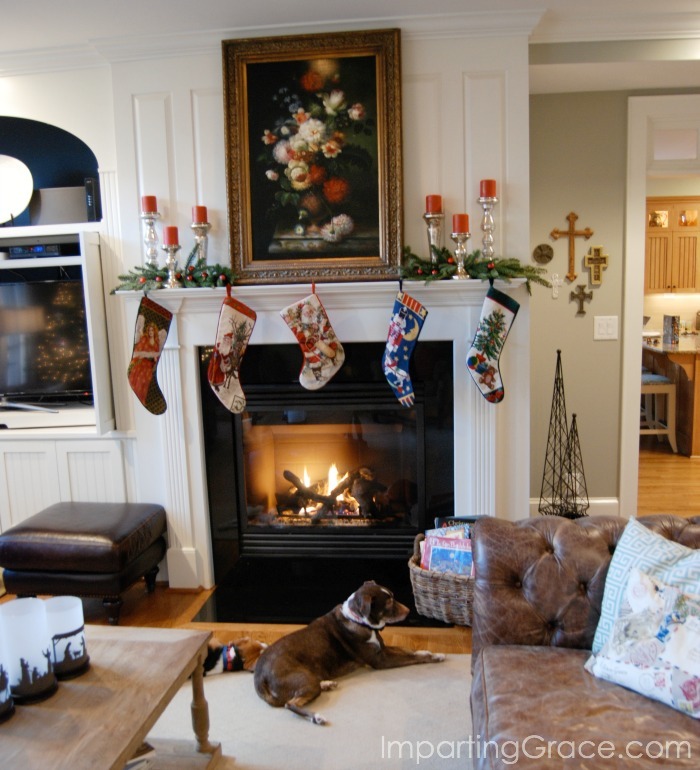 As you can see, the fireplace scene often involves our two dogs, Snickers and Cocoa. 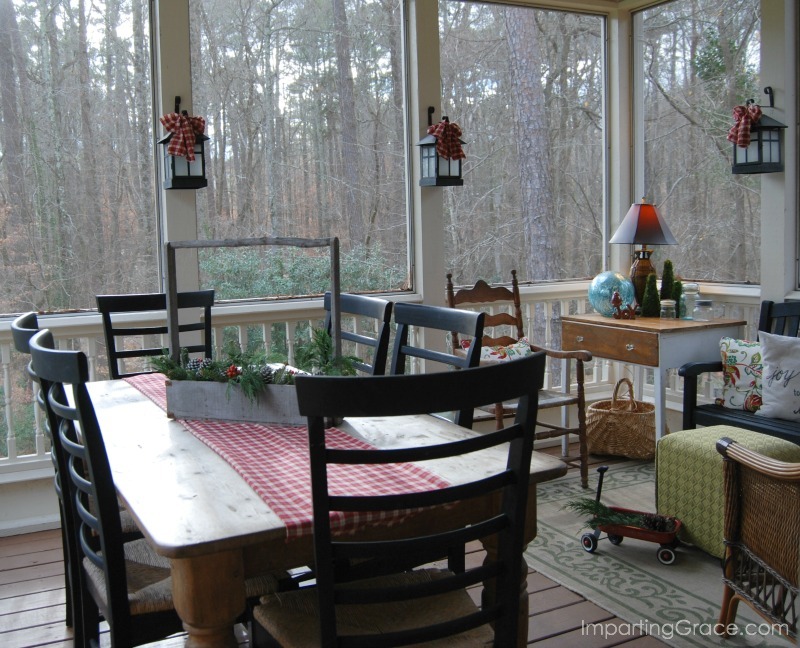 As you peek into the kitchen, you'll see that our newly remodeled island is looking good for Christmas. 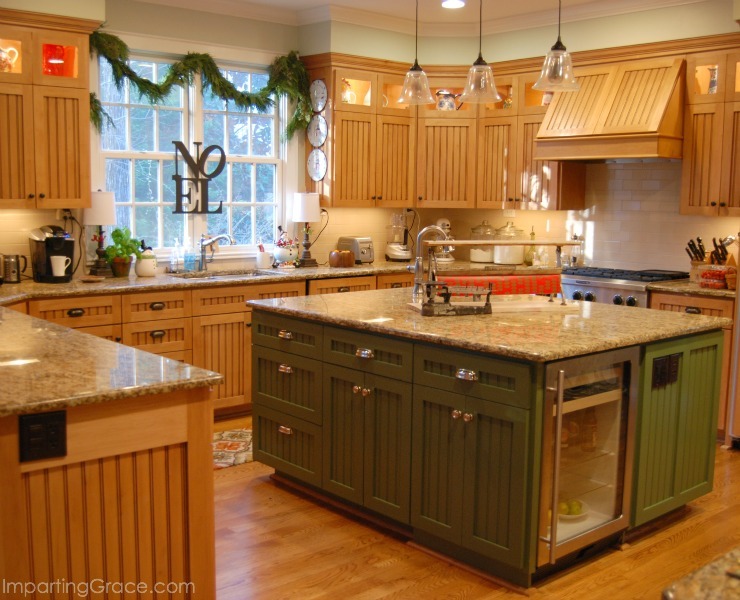 The green color and the beverage fridge are perfect for this season! I usually do a lot of decorating in the kitchen. Life has been a little busy this fall since our 21-year-old son had a stroke (he's doing well, thank God! ), so this year things are pretty simple. On the island are my antique wrapping paper dispenser and scale. 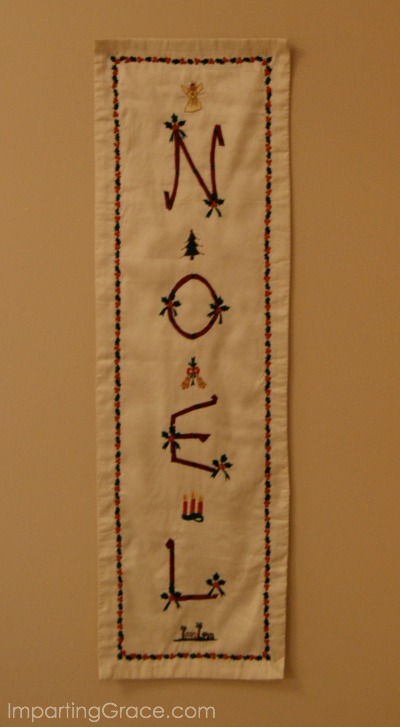 The window is sporting some garland, which smells divine, and my DIY "Noel." 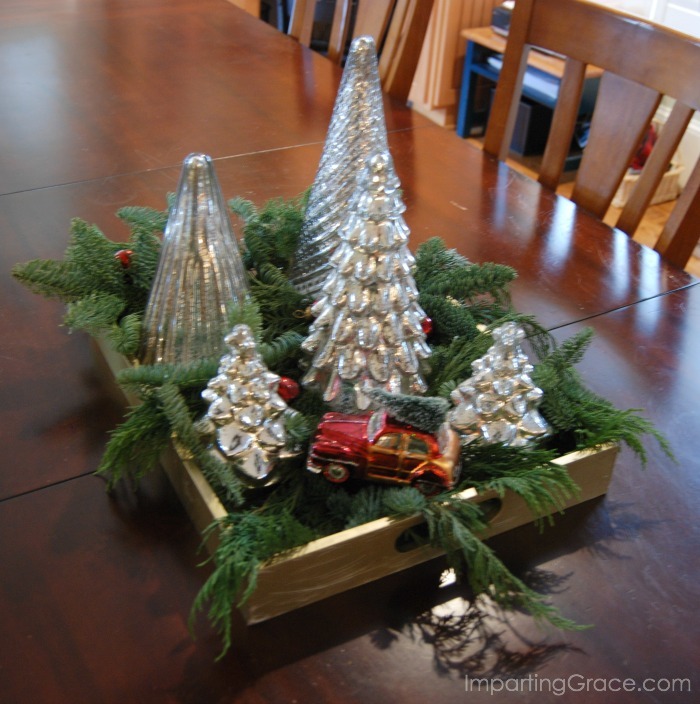 On the kitchen table is a simple centerpiece on a tray that can easily be whisked away. No muss, no fuss. Well, there is one fussy piece of decor. 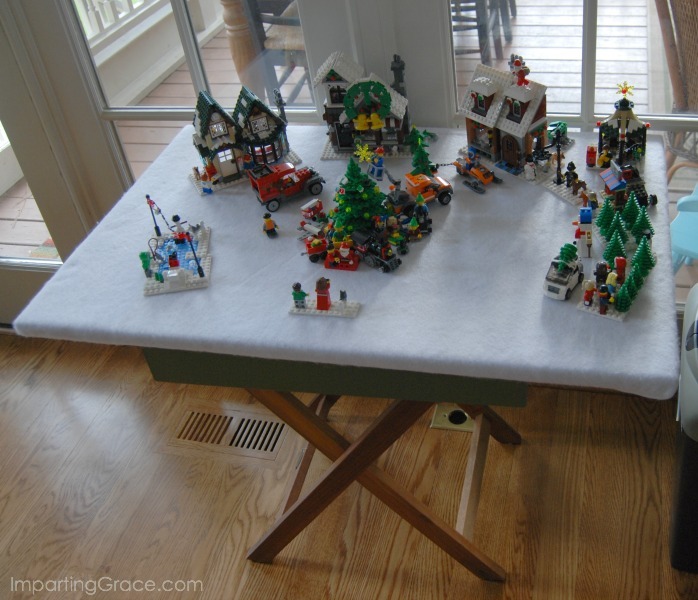 My sons built a LEGO Christmas village. Look--there's even someone taking pictures with Santa! The table runner is just a piece of plaid flannel which I folded and stapled into place. 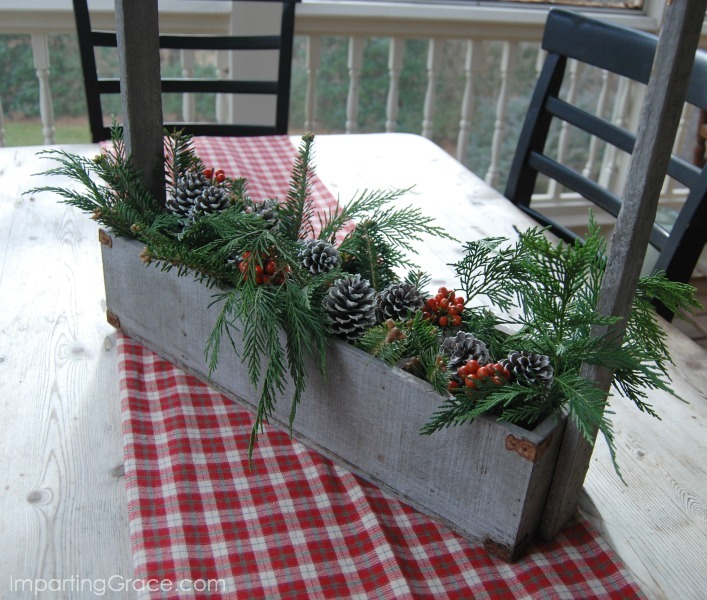 On it stands a tool caddy filled with greenery, some holly berries, and a few pine cones. Before I stapled that fabric into place on the table, I tore off a few strips to use as bows on the lanterns. 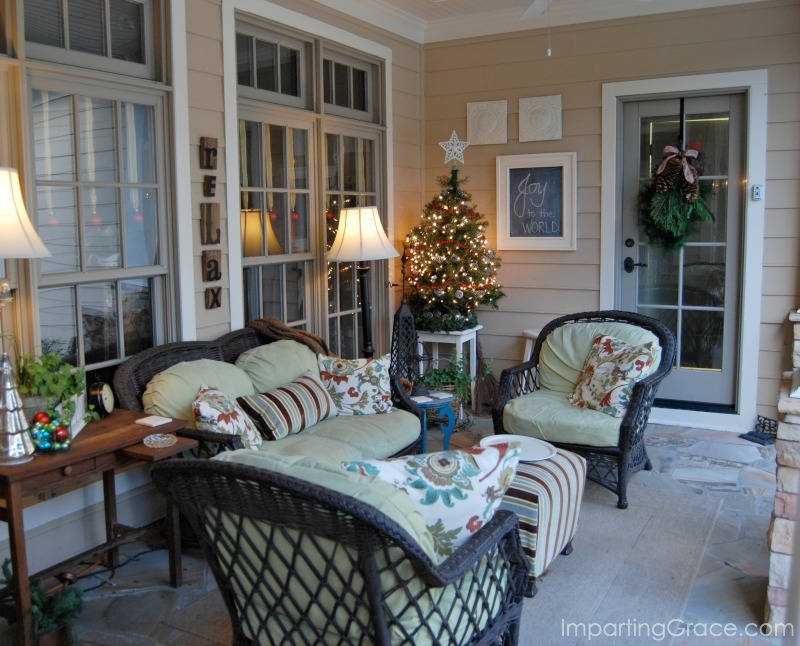 Those bows and a few other touches and the porch is ready to go. Myquillin at Nesting Place for her tour. Oh I do love your home and your decor. I could just move in and never leave. Gorgeous. You have a gorgeous home inside and out dear Richella. I love all the beautiful C'mas décor, it's stunning! Many blessings and a happy holiday to you sweet lady. I have the identical bench (pew) that I bought in an antique store in MT many years ago. You have such a beautiful home. I always love seeing your gorgeous fireplaces. 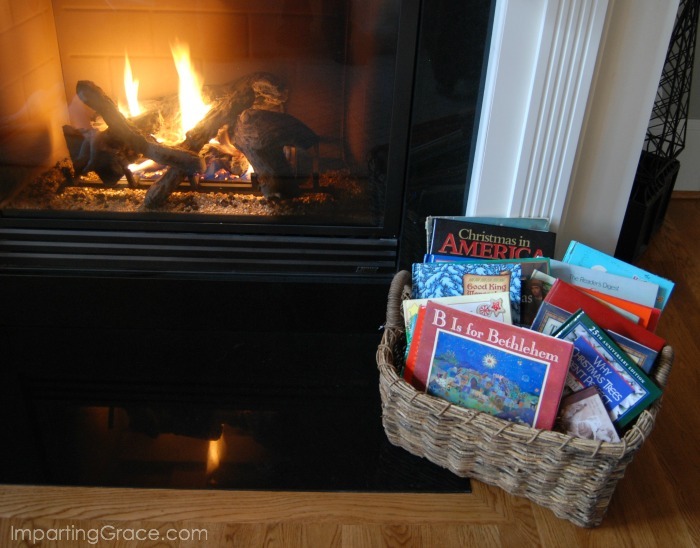 What a cute idea to add the basket of books! I might borrow that idea in my home! I hope your son is doing well. Have a wonderful holiday! 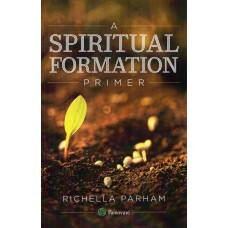 Everything is beautiful, Richella! I didn't know about your son. I hope he's doing well. Merry Christmas to you and your family! Love all your Christmas decorations ! 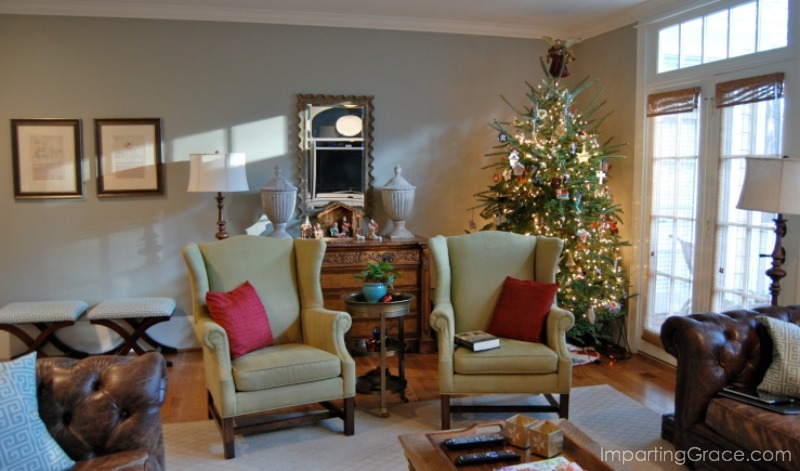 Everything looks so festive in your beautiful home ! So sorry about your son ..Hope he is doing well ..
Oh it's all so pretty! 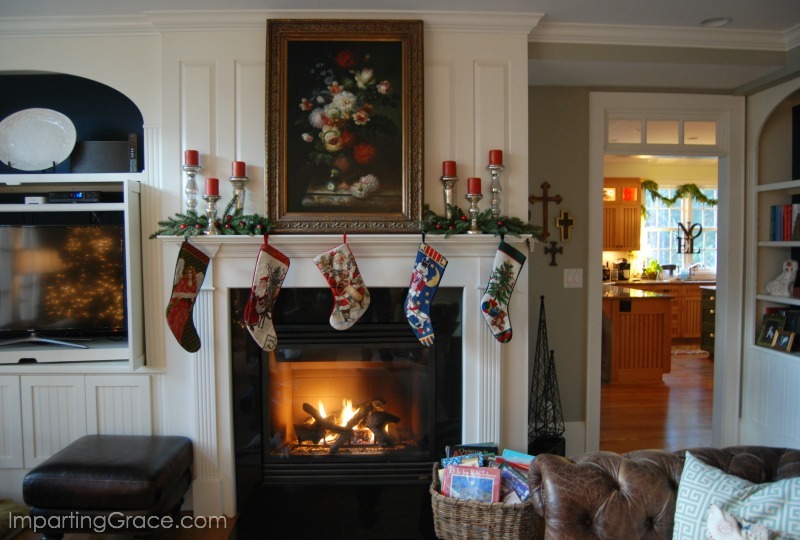 Your home just feels so warm & welcoming all the time & Christmas decor takes it to another place. I am so sorry about your son & I too, hope that he is doing well. Merry Christmas to you & your family, sweet friend! Happy your son is doing well...a wonderful blessing! Your home is so warm, inviting and beautiful! Wishing you all a very Merry Christmas! Everything is beautiful, Richella! 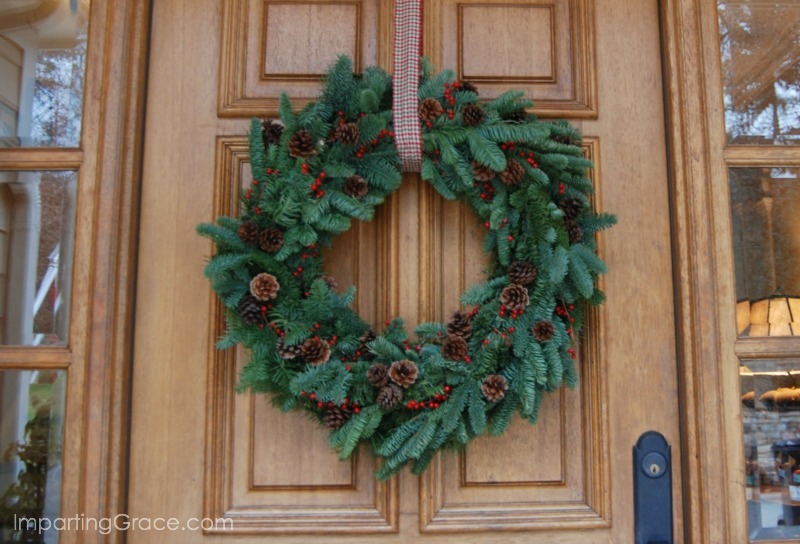 I especially love how you made your wreath for your door! Brilliant! So beautiful and warm, Richella. My boys would love that lego village! I'm so glad your son is doing well. Merry Christmas! 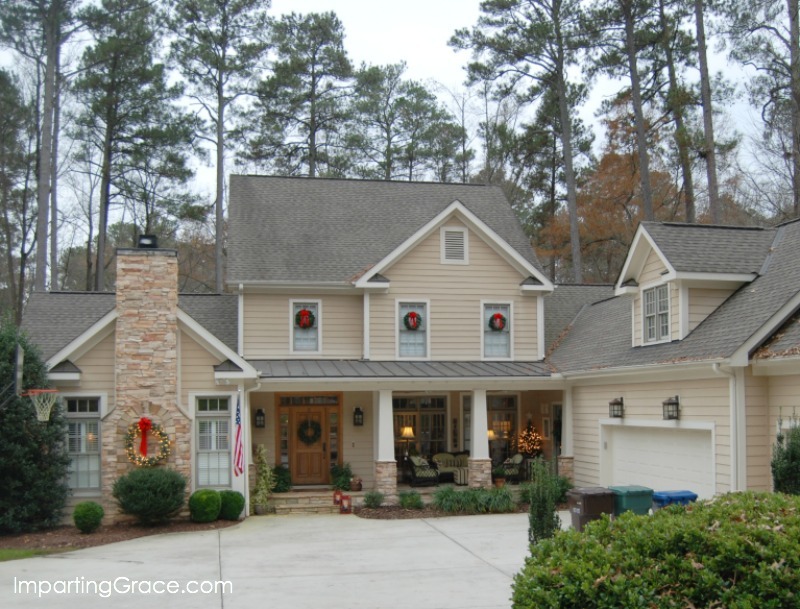 Your home is so beautiful anytime of the year, Richella, but it certainly shines in its Christmas attire! 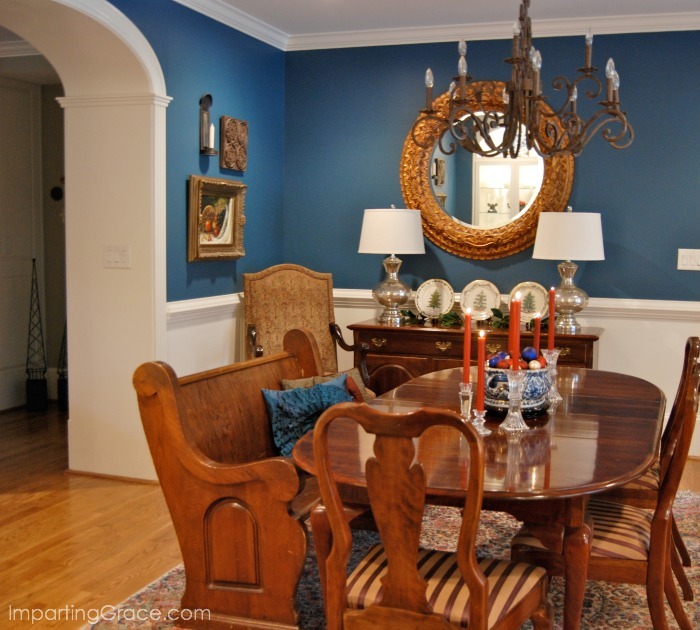 I love your home Richella and it looks gorgeous. One of these days I'm coming to visit. So be prepared!! Lovely, and so warm and inviting! Just beautiful! Hello. Lovely and says Christmas Joy all through the house! Merry Christmas and may all the rooms be filled with the people you love and cherish! God Bless you and your whole family! So glad your son is doing great! Full recovery as a Christmas miracle for him! 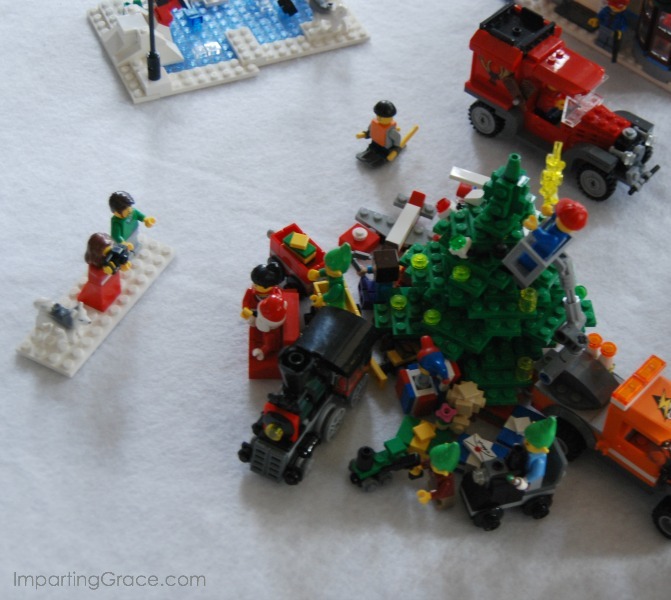 I love your Christmas decor, especially the Lego Christmas Village! OMG!!! That is precious! I stopped over from Kelly's Korner. If you get a chance, stop by #36. Happy Holidays! Everything is just so lovely! I especially love those special red ornaments hanging in your windows. Hope you have a very merry Christmas!! Hi Richella! I love so many of your Christmas decorations! 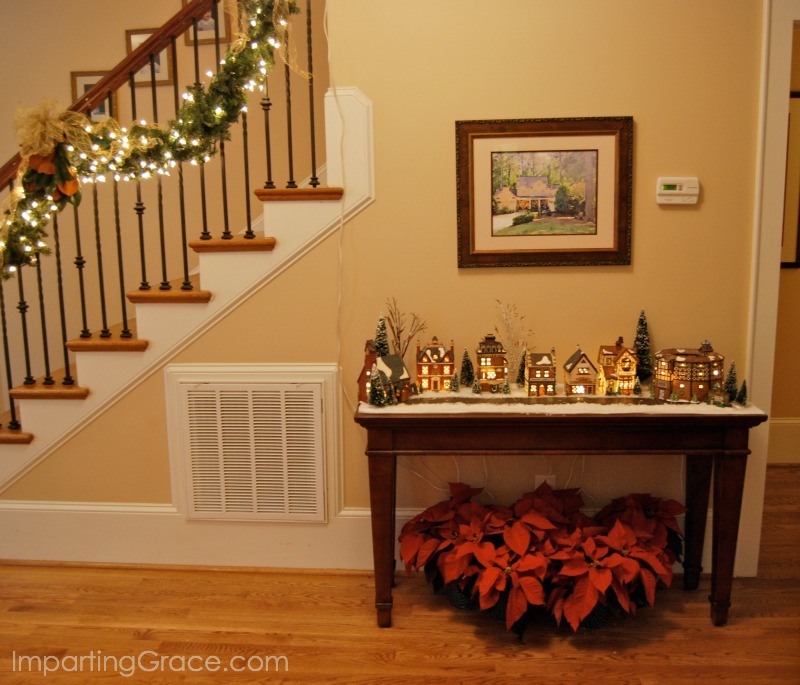 What a clever idea to hide those pesky cords with those poinsettias! I also appreciate the Lego village since my son, who is now 29, loved Legos so much. I still have a Santa he made for me and I put it out with my decorations every year. Thanks for adding your dogs in one of the photos....special touch. Happy to hear your son is doing well. Your home looks beautiful! And I love the JOY sign! I have said it before but will again...What a lovely home! 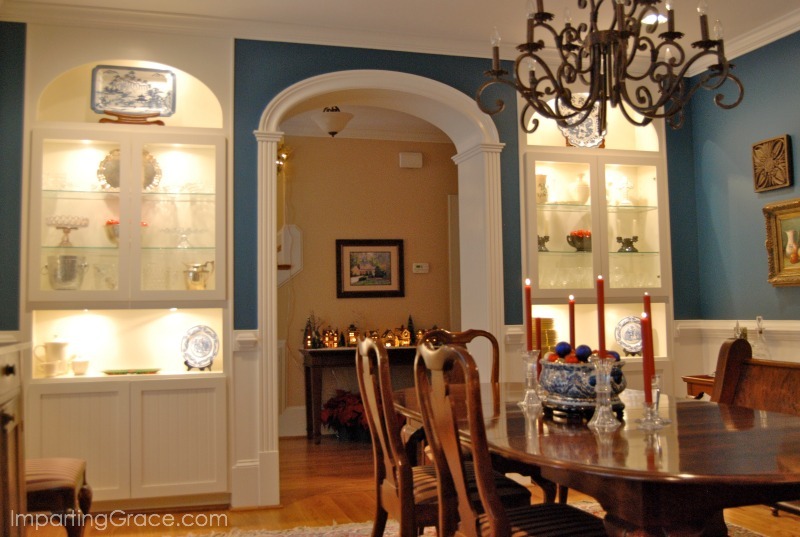 I would really enjoy working in your kitchen, especially now that you have a wine fridge (haha)! I really like your box of trees (I have many of the same ones) and I might put that on my "to do list" for next year! Enjoy the holidays - and so happy to know that your son is well! Everything looks beautiful! Can you tell me where you found the little car in the kitchen table vignette? I love that! MERRY Christmas. Hope your son is MUCH better, I am going to go read about what happened. Scary!! !